This article is about the film. For the video game, see Brave (video game). For the soundtrack, see Brave (soundtrack). Brave is a 2012 American computer-animated fantasy film produced by Pixar Animation Studios and released by Walt Disney Pictures. It was directed by Mark Andrews and Brenda Chapman and co-directed by Steve Purcell. The story is by Chapman, with the screenplay by Andrews, Purcell, Chapman and Irene Mecchi. The film was produced by Katherine Sarafian, with John Lasseter, Andrew Stanton, and Pete Docter as executive producers. 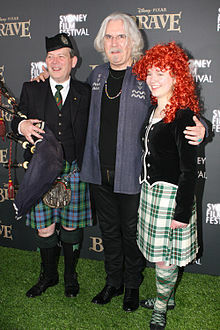 The film's voice cast features Kelly Macdonald, Billy Connolly, Emma Thompson, Julie Walters, Robbie Coltrane, Kevin McKidd, and Craig Ferguson. Set in the Scottish Highlands, the film tells the story of a princess named Merida who defies an age-old custom, causing chaos in the kingdom by expressing the desire not to be betrothed. Chapman drew inspiration for the film's story from her relationship with her own daughter. Co-directing with Mark Andrews, Chapman became Pixar's first female director of a feature-length film. To create the most complex visuals possible, Pixar completely rewrote their animation system for the first time in 25 years. Brave is the first film to use the Dolby Atmos sound format. 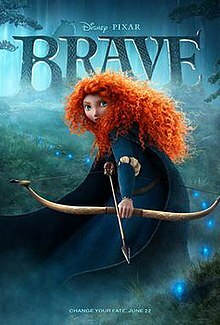 Brave premiered on June 10, 2012, at the Seattle International Film Festival, and was released in North America on June 22, 2012, to both positive reviews and box office success. The film won the Academy Award, the Golden Globe, and the BAFTA Award for Best Animated Feature Film. Preceding the feature theatrically was a short film entitled La Luna, directed by Enrico Casarosa. Ten years later, Merida is told that she is to be betrothed to the son of one of her father's allies. Elinor explains that failure to consent to the betrothal could harm Dunbroch, reminding Merida of a legend of a prince whose pride and refusal to follow his father's wishes destroyed his kingdom. The allied clan chieftains and their first-born sons arrive to compete in the Highland games for Merida's hand in marriage. Merida twists the rules, announcing that as her own clan's firstborn she is eligible to compete for her own hand. She easily bests her suitors in an archery contest, shaming the other clans, and after a heated argument with Elinor, runs away into the forest. Wisps appear, leading her to the hut of an elderly witch. Merida bargains for a spell to change her fate, and the witch gives her an enchanted cake. When Merida gives Elinor the cake, it transforms her into a bear, unable to speak but still retaining most of her human consciousness. Merida returns to the witch's cottage with Elinor, only to find it deserted, and discovers a message from the witch: unless Merida is able to "mend the bond torn by pride" before the second sunrise, the spell will become permanent. Merida and Elinor are led by the wisps to ancient ruins, where they encounter Mor'du. Realizing that Mor'du was the prince in the legend, Merida vows that she will not let the same thing happen to her mother, and concludes she needs to repair the family tapestry she damaged during their argument. They return to the castle to find the clans on the verge of war. Merida intends to relent and declare herself ready to choose a suitor as tradition demands, but Elinor prompts her instead to insist that the firstborns should be allowed to marry in their own time to whomever they choose. The clans agree, breaking tradition but renewing and strengthening their alliance. Merida sneaks into the tapestry room with Elinor. Elinor, who is losing her humanity, attacks Fergus, but suddenly regains her composure and flees the castle. Mistaking the queen for Mor'du and unwilling to listen to Merida, Fergus pursues the bear with the other clans, locking Merida in the castle. Merida escapes and repairs the tapestry while riding after her father. Fergus and the clans capture Elinor, but Merida intervenes and stops her father before Mor'du arrives. Mor'du batters the clan warriors and targets Merida, but Elinor intercedes, holding off Mor'du and causing him to be crushed by a falling menhir. This releases the spirit of the prince, who silently thanks Merida for freeing him. Merida covers her mother in the repaired tapestry, but she remains a bear. As the sun rises for the second time, Merida realizes the mistakes she has made and reconciles with Elinor, unknowingly fulfilling the true meaning of the witch's message and reversing the spell's effects. With Mor'du gone, Merida and Elinor work together on a new tapestry when they are called to the docks to bid farewell to the other clans, and ride their horses. Kelly Macdonald as Merida, a sixteen-year-old Scottish princess and skilled archer who dreams of following her own path and living her own life. Peigi Barker as Young Merida. Emma Thompson as Queen Elinor, Dunbroch's queen and Merida's mother, whose respect for protocol and tradition brings her into conflict with her daughter. Billy Connolly as King Fergus, Dunbroch's king and Merida's boisterous father. Julie Walters as The Witch, a crafty and bumbling old witch who agrees to help Merida. She is also a master woodcarver. Robbie Coltrane as Lord Dingwall. Kevin McKidd as Lord MacGuffin and Young MacGuffin, whose lines were spoken in Doric. Craig Ferguson as Lord Macintosh. Steven Cree as Young Macintosh. Steve Purcell as The Raven/Crow, A talking raven who has his own opinions on his mistress' way of thinking as well as her abilities. Patrick Doyle as Martin, the guard. John Ratzenberger as Gordon, the guard. Sally Kinghorn and Eilidh Fraser as Maudie, the castle maid. She is terribly afraid of bears. Callum O'Neill as Wee Dingwall. Announced in April 2008 as The Bear and the Bow, Brave is Pixar's first fairy tale. Writer and director Brenda Chapman considers it a fairy tale in the tradition of Hans Christian Andersen and the Brothers Grimm. She also drew inspiration from her relationship with her daughter. Chapman conceived the project and was announced as the film's director, making her Pixar's first female director, but in October 2010, she was replaced by Mark Andrews after creative disagreements between her and John Lasseter. Chapman found the news of her replacement "devastating," but later stated that her "vision came through in the film" and that she remained "very proud of the movie, and that I ultimately stood up for myself." Chapman then stated in an interview in 2018 that while she was still bittersweet about taken off the film and believed that there was no reason to do so creatively, she felt that it "opened more doors for me to have that happen". Brave is the first Pixar film starring a female protagonist. In that respect, Brave was followed by Inside Out, Finding Dory, and Incredibles 2, all of whom featured female protagonists. Merida was originally to be voiced by Reese Witherspoon, who declined due to scheduling issues. According to Andrews, she was on the project for "quite some time. She was getting her Scottish accent down, she was working very hard and it was sounding great but as we were continuing with the movie she had other movies lining up, so unfortunately we were unable to continue with her and had to get a replacement." Instead, the character was voiced by Scottish actress Kelly Macdonald. In 2016, while promoting Illumination's Sing, Witherspoon mentioned that she had to leave the film due to failure to master a Scottish accent. The score for Brave was composed by Patrick Doyle and performed by the London Symphony Orchestra. The orchestra was conducted by James Shearman. To bring some of Scotland's native flavor to the music, Doyle used traditional Celtic instruments such as bagpipes, a solo fiddle, Celtic harps, flutes and the bodhrán, with an electronically treated dulcimer and cimbalom to give it a more contemporary feel. "I employed many classic Scottish dance rhythms such as reels, jigs, and strathspeys, which not only serve the action but keep it authentic," said Doyle. As part of his research, he spent time in the Hebrides studying "unaccompanied Gaelic psalm singing." In addition to Doyle's music, the film features three other original songs; "Learn Me Right" written by Mumford & Sons and performed with Birdy, "Touch the Sky" (music by Alex Mandel, lyrics by Mark Andrews & Mandel) and "Into the Open Air" (music and lyrics by Alex Mandel). Both "Touch the Sky" and "Into the Open Air" were performed by Julie Fowlis, as Merida's off-screen musical thoughts. These two tracks were produced by composer and arranger Jim Sutherland, who is also featured as a performer. The Walt Disney Company registered the Clan DunBroch tartan with the official Scottish Register of Tartans upon release of the film. The tartan consists of ocean blue for the North Sea, subdued scarlet for bloodshed during the clan wars, deep green for the Scottish Highlands, navy blue for the eventual unity of the four clans, and gray for the Scottish people. In selecting the color scheme, Pixar took historical considerations, stating that "[t]here was a concerted effort to use hues that were indicative of the less saturated dyeing techniques [used] during the ancient period in which the fantasy film is set." The registration was celebrated at the film's British premiere in Edinburgh, where Scottish First Minister Alex Salmond presented a certificate to director Mark Andrews. However, Member of the Scottish Parliament Alex Johnstone criticized the registration (as well as other fiction-based entries such as one for Peter Rabbit) as "shallow and irreverent." Mr. Johnstone contended that the 2008 legislation that created The Scottish Register of Tartans was intended to prevent such entries and protect Scotland's heritage. The film was initially set for release on June 15, 2012, but the date was later changed to June 22, 2012. On April 3, 2012, Pixar screened the film's first 30 minutes, which received a positive reaction. The film premiered on the last day of the Seattle International Film Festival on June 10, 2012. It had its Australian premiere on June 11, 2012, at the Sydney Film Festival, its domestic premiere on June 18, 2012, at Hollywood's Dolby Theatre as part of the Los Angeles Film Festival, its European premiere at the Taormina Film Festival in Sicily on June 23, 2012, and its British premiere at the Edinburgh International Film Festival on June 30, 2012, with Kelly Macdonald, Robbie Coltrane, Craig Ferguson, Brian Cox, Kevin McKidd, Ewen Bremner, Kate Dickie, Julie Fowlis, Patrick Doyle, Daniela Nardini and Alex Salmond in attendance. Brave was released on Blu-ray, Blu-ray 3D, DVD, and digital download on November 13, 2012. It includes La Luna and a new short film, The Legend of Mor'du, which explores the history of Mor'du, from The Witch's perspective. The DVD contains audio commentary by director Mark Andrews, co-director/screenwriter Steve Purcell, story supervisor Brian Larsen, and editor Nick Smith. Brave earned $237.3 million in North America, and $303.2 million in other countries, for a worldwide total of $540.4 million. It was the 13th highest-grossing film of 2012, the eighth highest-grossing Pixar film, and the third highest-grossing animated film that year behind Ice Age: Continental Drift ($875.3 million) and Madagascar 3: Europe's Most Wanted ($746.9 million). In North America, pre-release tracking suggested the film would open between $55 million to $65 million in North America, which is slightly below average for a Pixar film, as trackers initially suggested that as a "princess story", the film might not appeal as much to male audiences. Brave received a 79% approval rating on the review aggregator website Rotten Tomatoes based on reviews from 237 critics, with an average rating of 7/10. The site's critical consensus reads: "Brave offers young audiences and fairy tale fans a rousing, funny fantasy adventure with a distaff twist and surprising depth." Another review aggregator, Metacritic, which assigns a normalized rating out of 100 top reviews from mainstream critics, calculated a score of 69 based on 37 reviews, or "generally favorable". The film was well-received among American audiences, earning an "A", according to CinemaScore. Roger Ebert of the Chicago Sun-Times gave the film 3 out of 4 stars. He wrote, "The good news is that the kids will probably love it, and the bad news is that parents will be disappointed if they're hoping for another Pixar groundbreaker. Unlike such brightly original films as Toy Story, Finding Nemo, WALL-E, and Up, this one finds Pixar poaching on traditional territory of Disney." He said that the film did have an uplifting message about improving communication between mothers and daughters, "although transforming your mother into a bear is a rather extreme first step". Peter Debruge of Variety gave a positive review of the film, writing that the film "offers a tougher, more self-reliant heroine for an era in which princes aren't so charming, set in a sumptuously detailed Scottish environment, where her spirit blazes bright as her fiery red hair". Debruge said that "adding a female director, Brenda Chapman, to its creative boys' club, the studio Pixar has fashioned a resonant tribute to mother-daughter relationships that packs a level of poignancy on par with such beloved male-bonding classics as Finding Nemo". Conversely, Todd McCarthy of The Hollywood Reporter gave it a negative review, stating that the film "diminishes into a rather wee thing as it chugs along, with climactic drama that is both too conveniently wrapped up and hinges on magical elements that are somewhat confusing to boot". Leonard Maltin on IndieWire said, "I'll give it points for originality, but that story twist is so bizarre that it knocked me for a loop. The movie tries to make up for this detour with a heart-tugging, emotional finale, but the buildup to that moment has been undermined, so it doesn’t have the impact it should." Some reviewers saw the Merida character as a novel break from the traditional line of Disney princesses. There were some dissonance and criticism among viewers and organized feminists when her character was scheduled to be "crowned" a Disney princess, only for artists to render her thinner, with less frizzy hair, and rounder eyes, more like the other princesses from previous Disney movies. This inspired girl-empowerment website A Mighty Girl to file a petition that Disney not alter their character. One of the 262,196 signatories was Brenda Chapman, the director of the film, who felt that Disney had "betrayed the essence of what we were trying to do with Merida — give young girls and women a better, stronger role model", and that the makeover was "a blatantly sexist marketing move based on money". The online petition was considered a success, as shortly after it appeared Disney removed the redesigned image from their official website, in favor of Merida's original film appearance. Disney later clarified the situation, assuring that Merida would remain in her original form. I don't know if there will be another one. We never make a film at Pixar to have a sequel. It is always nice when you do and we kind of have a philosophy that if we find the right story then we will. Surely the marketing and success of Brave says that you can have one and they will come. Merida appears as a recurring character in the fifth season of Once Upon a Time (2015–16). Merida makes a special appearance in a 2015 episode of Sofia the First titled "The Secret Library". Merida appeared as a guest appearance in the 2018 Walt Disney Animation Studios (WDAS) film Ralph Breaks the Internet along with the rest of the members of the Disney Princess line voiced by her original voice actress Kelly Macdonald. ^ a b "Brave (2012)". Box Office Mojo. Retrieved August 20, 2016. ^ a b c d e f g h "'Brave' director Brenda Chapman breaks silence: Getting taken off film 'heartbreaking... devastating... distressing'". August 15, 2012. ^ a b "OSCARS: 85th Academy Award Nominations – Only 9 Best Pictures; 'Lincoln' Leads With 12 Nods, 'Life Of Pi' 11, 'Les Misérables' And 'Silver Linings Playbook' 8, 'Argo' 7, 'Skyfall' And 'Amour' And 'Zero Dark Thirty' And 'Django Unchained' 5". Deadline. January 10, 2012. Retrieved January 10, 2012. ^ Radulovic, Petrana (December 17, 2018). "Prince of Egypt director Brenda Chapman: 'We wanted to do something that reached more adults'". Polygon. Retrieved December 28, 2018. ^ Reynolds, Simon (April 4, 2012). "'Brave' preview: Mark Andrews on Pixar's Scotland-set fantasy tale". Digital Spy. Retrieved January 15, 2017. ^ Young, John (March 28, 2011). "Pixar's 'Brave': First Look art -- EXCLUSIVE PHOTOS". Entertainment Weekly. Archived from the original on March 23, 2015. Retrieved January 15, 2017. ^ Gordon, Naomi (January 12, 2017). "Reese Witherspoon admits she had to quit a movie because her Scottish accent was so bad". Cosmopolitan. Retrieved January 15, 2017. ^ Scotland, National Records of. "Tartan Details - The Scottish Register of Tartans". Retrieved June 14, 2016. ^ Bastoli, Mike (April 4, 2012). "Brave Preview Draws Cheers". Big Screen Animation. Archived from the original on July 20, 2012. Retrieved May 5, 2012. ^ Patten, Dominic (May 18, 2012). "'Brave' Premiere To Open Dolby Theatre But Will Dolby Mix Be Ready?". Deadline Hollywood. Retrieved May 19, 2012. ^ "Robbie Coltrane and Kelly MacDonald among stars to attend Edinburgh premiere of Brave". The Scotsman. Retrieved May 25, 2016. ^ "Scotland in focus as Brave premieres in Edinburgh". The Herald Scotland. Retrieved May 25, 2016. ^ "Disney/Pixar's Brave set for UK premiere at Edinburgh International Film Festival". Scottish Daily Record. Retrieved May 25, 2016. ^ "'Brave' 3D Blu-Ray Bonus Features to Include New 'Mor'du' Short, Alternate Opening, Bloopers and Much More". Stitch Kingdom. August 22, 2012. Archived from the original on August 25, 2012. Retrieved August 22, 2012. ^ Koch, Dave (August 27, 2012). "The Legend of Mor'du Short Announced For Brave Blu-Ray". Big Cartoon News. Retrieved August 27, 2012. ^ "Brave (2012) – Daily Box Office Results". Box Office Mojo. ^ "Brave (2012) – International Box Office Results". Box Office Mojo. ^ "Brave (2012)". Rotten Tomatoes. Retrieved November 12, 2018. ^ June, Daniel (May 10, 2013). ""Brave's" Merida Gets a Makeover, Upsetting Feminists and Others". JD Journal. Retrieved May 12, 2013. ^ Prudom, Laura (July 11, 2015). "'Once Upon a Time' Previews Merida from 'Brave,' Dark Swan for Season 5". Retrieved June 14, 2016. ^ Wagmeister, Elizabeth (September 1, 2015). "'Brave' Princess Merida to Appear on Disney Junior's 'Sofia the First'". Retrieved June 14, 2016. ^ Breznican, Anthony (July 14, 2017). "Wreck-It Ralph sequel will unite the Disney princesses — and Star Wars!". Entertainment Weekly. Retrieved November 4, 2018. Lerew, Jenny (2012). The Art of Brave (1st ed.). Chronicle Books. ISBN 978-1452101422. Wikimedia Commons has media related to Brave (2012 film).